Team Spruce has been hard at work on our newest update which includes not one, but two of our customers’ most requested features! This update also includes a few small changes that will improve the efficiency of managing your Spruce inbox. You can learn about all these changes below. 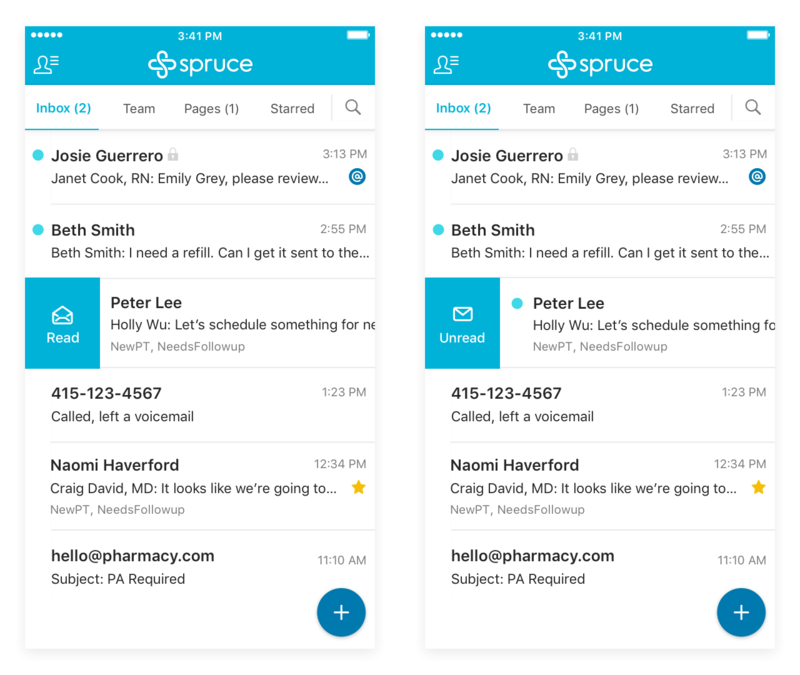 We know that for many practices on the platform, the Spruce inbox is the home of all communication – external and internal. As such, we are excited to have built a set of new tools and workflows to help supercharge the Spruce inbox for our users! With these new tools, managing daily tasks and activities from within Spruce should be easy. Itching to de-clutter your inbox? Now you can, with Archiving. Archiving allows you to ‘archive’ conversations that no longer need attention and move them out of your inbox. Archived conversations will appear in the “Archived” filter of your inbox, visible to you and every member of your team. Simply mark a conversation as “Unarchived” and it will return to your inbox. First, pages are now ‘sticky’! That means that conversations that you have been ‘paged’ in will remain in your “Pages” filter (even after you have read them) until you mark them as “Resolved”. 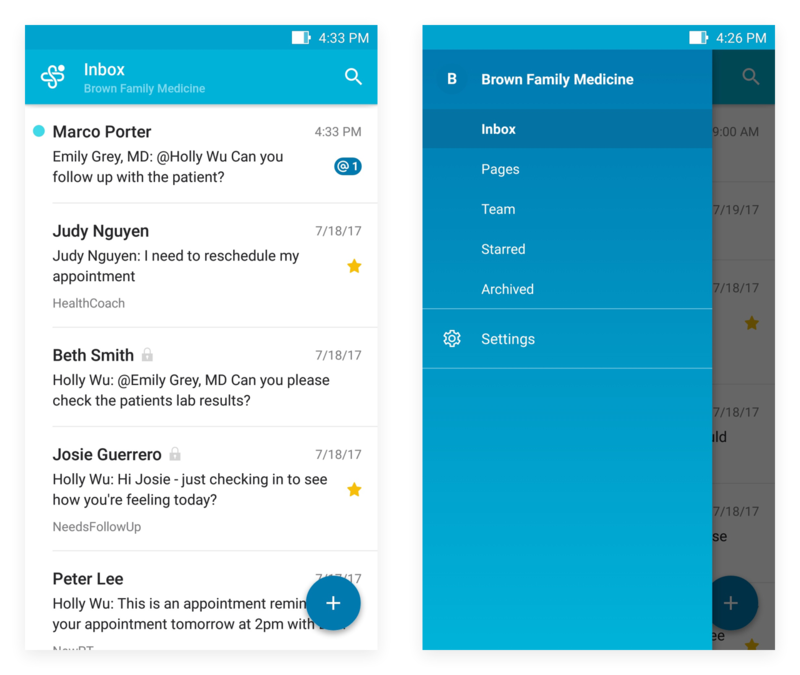 Second, you can now only Page teammates within an Internal Notes within a Patient Conversation. “Following” has now become “Starring.” Star conversations that you want to keep track of and need closer attention. Starred conversations are added to your “Starred” filter so that you can easily access the conversation and track updates via notifications. We’ve made it easier to mark conversations as “Read” or “Unread” on iPhone and Android. Simply swipe to the right on any conversation in the inbox to change from Read to Unread or vice versa. Using Spruce on your Android phone? To switch between your inbox filters and access your settings, tap the Spruce logo in the upper left of the home screen. The dot indicates when you have new messages in other filters. We built three other commonly requested features — an ‘Autoresponder’, Scheduled Messages, and Saved Messages. 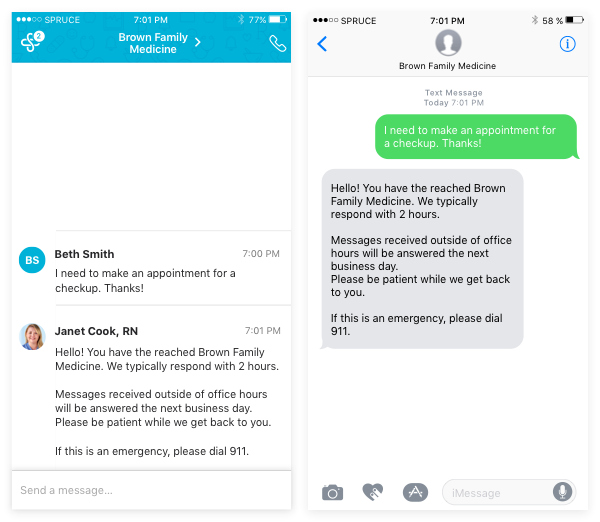 Together, these features make it easy for you to delight patients with quick, thoughtful responses. Automatically respond to incoming messages with an autoresponder. Great for after hours or out-of-office messages. Available for iPhone users now, coming soon to Android and the Web. Catching up on messages late at night and don’t want to send a message until the next morning? You can now schedule a message to be sent at a later date and time. Or if you want to respond quickly to common inquiries, reply faster using Saved Messages.